Fine. Slight shelf wear to cover/closed edge. Otherwise new and unread. Good. New and unread, however there is some shelf wear on cover, and there is a crease / dent running diagonally from top right corner to middle of spine on front cover. The edition I got was blue leather and in beautiful shape. The pages were slightly yellowed but the book was so inexpensive that the shipping actually cost more than the book. It is a classic and it arrived early. 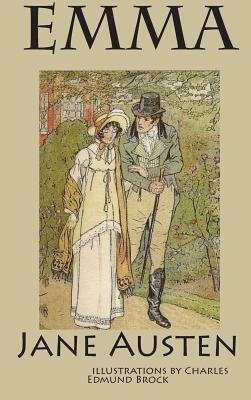 This is Pride and Prejudice's match (a hair less perfect but with its own delights), one with as entertaining a cast of characters, a heroine and hero with whom one is fully engaged, a fun and never too serious plot. I recall that Jane Austen wrote something about Emma being a heroine that no one else would like. I always found Emma easy to like - for someone spoiled by too much admiration, she's very generous and well-intentioned. And Mr. Knightly may be Austen's finest hero. Emma is a great book. Like someone stated earlier keeping up with characters is a major detail and possibly having a notepad writing down who is who and what they do wouldn't be such a bad idea. Emma is just a hopeless romantic wanting to help everyone else but never herself. I really enjoyed this book. After many attempts at reading Pride and Prejudice and never finishing, I have finally read one of Austen's novels. I recently saw the movie version of the Jane Austen Book Club and got caught up in these characters love for Austen. She is so popular and yet as much as I love reading was never able to get through her most popular work. So I decided to follow the sequence they used in the movie and ordered all 6 novels. Well, I just got through reading Emma and I can't tell you how much I enjoyed this. Although not much really happens in the novel, the characters are so alive and you get so caught up in their lives that it was difficult to put the book down. Another thing I found very rewarding is how at the end of the novel there are no loose ends. I can't wait to go on the Sense and Sensibility next!! GREAT book. I was confused by some characters at first because some have more than one name. For example, Miss Taylor is also called Mrs. Weston. It is worth the effort it may take to sort out character connections.